Homepage. This page: Expecting cold weather? then 1950s' motorists may well have opted for a few pints of Thermidor. Once upon a time, in the winter months, the last thing a motorist would do before tucking their car away for the night, whether out on the street, or in the relative comfort of one's motorhouse, would be to drain the radiator of water to avoid it freezing. Forget to drain the water, and you could easily be presented with a cracked block in the morning. Equally damaging, set off down the road having forgotten to replenish the engine with water that morning, and you'd soon cook the motor. A paragraph inside the leaflet echoes these issues: "Nightly draining is not only tedious, but liable to be overlooked on occasion, and it is of no avail should a severe frost occur whilst the vehicle is parked during the day. Furthermore, where a cooling system incorporates a thermostat it is even possible in exceptionally cold weather for the radiator to freeze up when the vehicle is in motion, before the thermostat opens to permit hot water to circulate through the radiator from the cylinder block." As the 1930s went by, more and more people opted to mix in antifreeze with their car engine's coolant, thus saving themselves an onerous task. Many brands of antifreeze would begin to be offered. 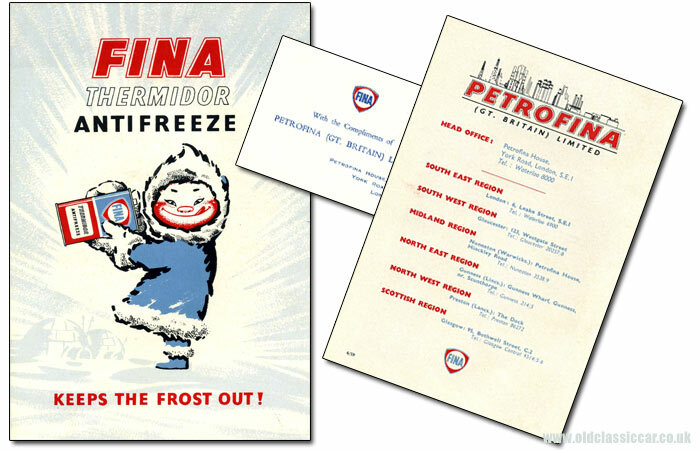 This leaflet, for Fina's Thermidor Antifreeze, dates to the late 1950s. Those who didn't wish to trust in antifreeze, or who were running their car on a shoestring, may instead have chosen to use an engine heater, such as the Everwarm. However if that ran out of paraffin, the risk of freezing would swiftly return, and a cracked engine block could easily see an already-ropey car making a one-way trip to the breaker's yard. This leaflet explains that Thermidor was an ethylene gycol-based antifreeze, and a 25% mix of antifreeze mixed in the cooling system would protect an engine to -15F. It also incorporated certain anti-corrosion inhibitors, a major help in keeping the water galleries clear and free-flowing. Fina Thermidor was a product of Petrofina (Gt. Britain) Limited. Fina is perhaps best known for its motor fuels, and of course lubricants - an example of the latter can be seen on the Motortonic oils page. This car park ticket features an illustration of a Fina petrol pump globe.